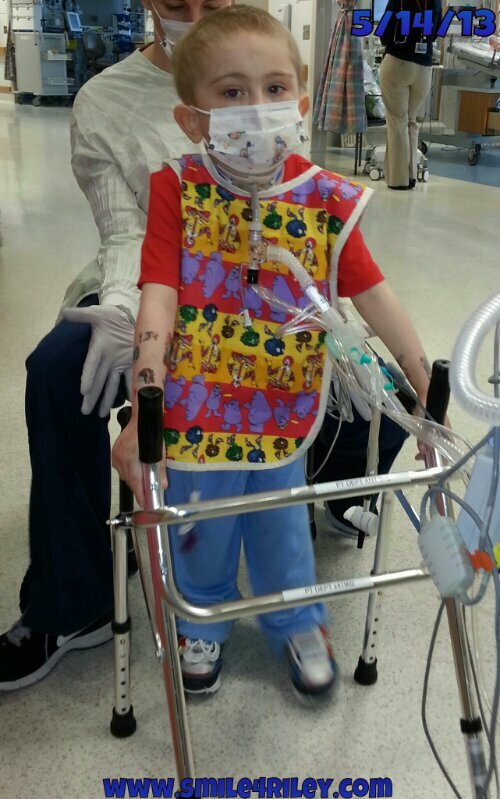 Update … Riley has been making Great progress on the Trilogy Ventilator. On Monday May 20th his daytime settings were reduced to just CPAP. We have been able to leave the cuff down on the trach 24/7 for about the last week and a half but Now there is No PEEP .. No Rate .. No Pressure Support .. Nothing but CPAP. He still has some support overnight with the vent but this is All Wonderful progress! 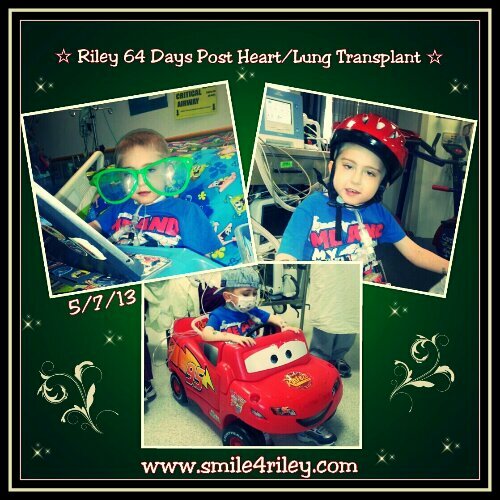 On Thursday May 16th Riley’s trach was able to be downsized. Prior to the downsizing there were many attempts to use a Passy-Muir Valve. This one-way valve attaches to the outside opening of the tracheostomy tube and allows air to pass into the trach, but not out through it. The valve opens when a person breathes in. When the person breathes out, the valve closes and air flows around the trach tube, up through the vocal cords allowing sounds to be made. Since Riley’s trach was larger every attempt with the Passy put him into major distress, but after downsizing … Riley has found his Voice! He is a Chatter Box .. seemingly making up for all the time he was silenced! Assuming Riley continues to progress the way he has over the last few weeks the Hope is to Decannulate before discharge! Decannulation would be removing the trach! Huge! Please continue to pray that things keep moving the same way! Riley had a really rough landing as Dr Kreindler says. It took him many weeks before he had all of his wheels on the ground. He is still dealing with some GI issues but the Dark time has passed! The thought of ever returning to such a place is terrifying! We had our family meeting with the team on Monday. Riley will be transferred to the 7th floor .. Progressive Care Unit (PCU) .. When a bed opens. There are only two private rooms in the PCU so it will most likely take a few days. There Riley will continue therapies and trach care. The PCU is a Whole different world then our Home on the 6th floor but it’s a move we have to make. At least if there are any set backs the CICU is only one floor below. Moving to the PCU is a Big step in the right direction. There were Weeks that we were Praying for Riley to be able to take just even a step forward! If Riley Continues to progress the way he has over the last three weeks there is talk of him possibly not needing the trach when he finally goes Home. That being said .. Going Home is not planned for anytime in the near future. Again though if Riley continues on the way he has been he Could be ‘Home’ by July 4th!